Iran, Dec. 1, 2018 - The Greater Tehran Bus Syndicate issued a statement condemning the arrest and beating of Esmaeel Bakhshi, a representative of the protesting Haft Tapeh sugarcane mill workers in Shush, southwest Iran, and demanding his immediate release. This syndicate is also calling for the closure of all judicial cases raised against other Haft Tapeh employee representatives. Security forces have resorted to threats and crackdown measures against the workers’ representatives to create a climate of fear, the statement reads in part. Authorities have raised bogus charges against Bakhshi for his resistance in the faces of conspiracies launched against him. Bakhshi has also been attacked, imprisoned, harassed and placed under torture, the statement adds. On Thursday, the mullahs’ regime dispatched the mayor of Shush along with a group of Revolutionary Guards (IRGC) Basij members under the pretext of college students to the workers’ rally site to claim authorities have come to listen to their demands. Shush mayor Seyed Razi is well-known and highly abhorred by the locals. In their protests, the workers have repeatedly chanted slogans against him and refused to listen to his words. Authorities intended to send these individuals among the workers to deceive the public and bring an end to this protest and strike. 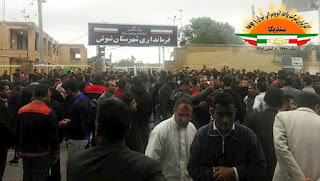 The protesting Haft Tapeh employees, however, protested their presence and separated their ranks from the Basij members. They also chanted slogans against the regime’s authorities, ending their deceitful measures in complete failure. The protesting workers, continuously chanting slogans and forcing officials to leave the scene, disrupted the remarks delivered by regime officials for the small crowd of Basij members repeatedly. “Jailed workers must be released,” the workers were chanting. The workers were also holding signs of Esmaeel Bakhshi, the apprehended workers’ representative, demanding his immediate release. In other reports, security and crackdown forces arrested Ali Nejati, former head of the Haft Tapeh sugarcane mill syndicate, from his home and transferring him to an unknown location. Ali Nejati suffers from heart illness and is currently in poor conditions. The Iranian Resistance calls for urgent action by the United Nations High Commissioner for Human Rights and international labor syndicates to demand the immediate release of Ali Nejati and other arrested workers.